Zap-a-what? 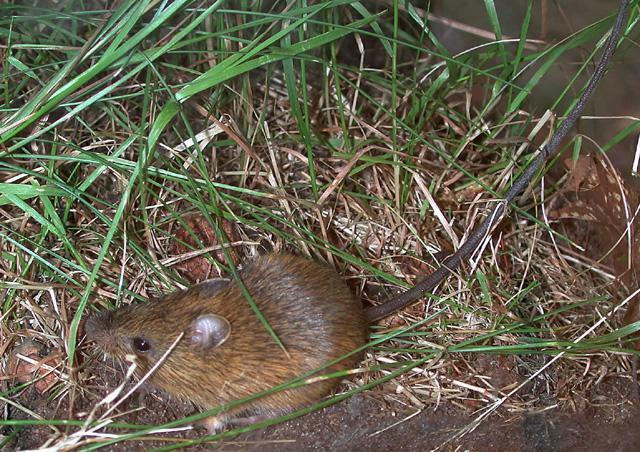 Okay, we don’t call it that, but Zapus hudsonius is the scientific name of the Meadow Jumping Mouse. 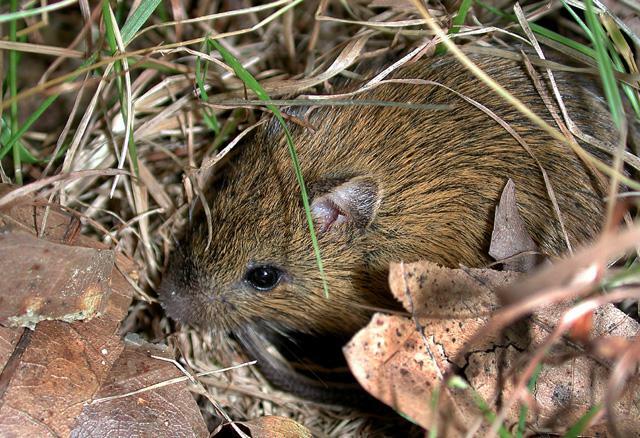 This distant relative of us squirrels–we are both rodents–is common throughout eastern North America. If you’ve seen a mouse with a tail nearly as long as mine, it’s probably Zapus. I’ve had to borrow pictures, but as a result I’ve found a very cool website devoted to wildlife. If you need to do animal research, I recommend Animal Diversity Web. Our photos today are by Phil Myers (photographer; copyright holder), Museum of Zoology, University of Michigan. Mice and their look-alikes, voles, are common in suburban areas, especially where people feed birds. Though we both frequent the people feeding spots, otherwise we don’t see a lot of each other. 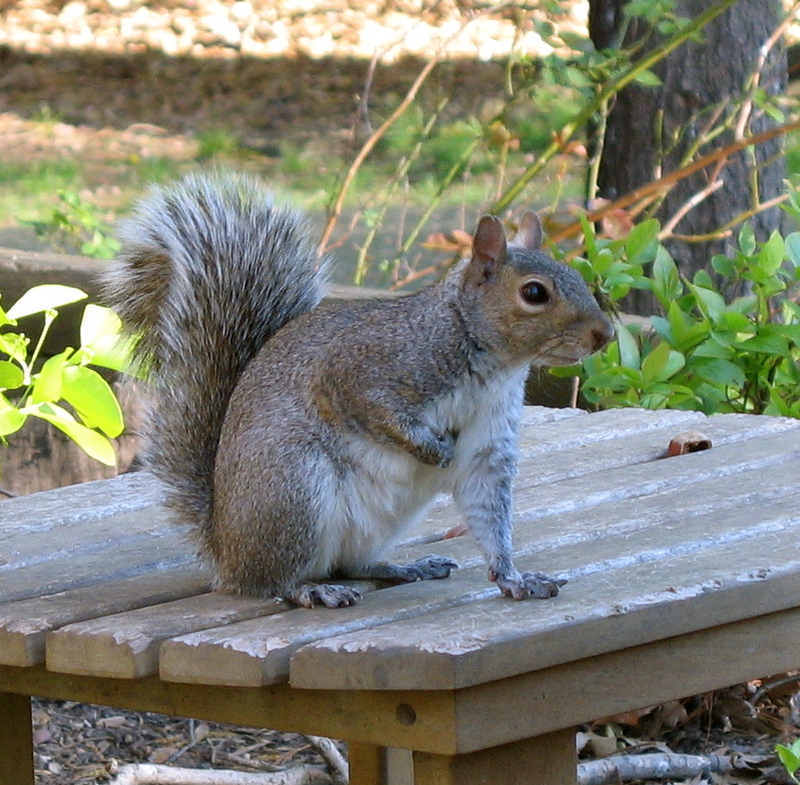 Mice prefer small seeds to acorns. They can’t climb trees and we don’t spend much time on the ground. So we aren’t competing for food or space. Water, on the other hand, we both need. 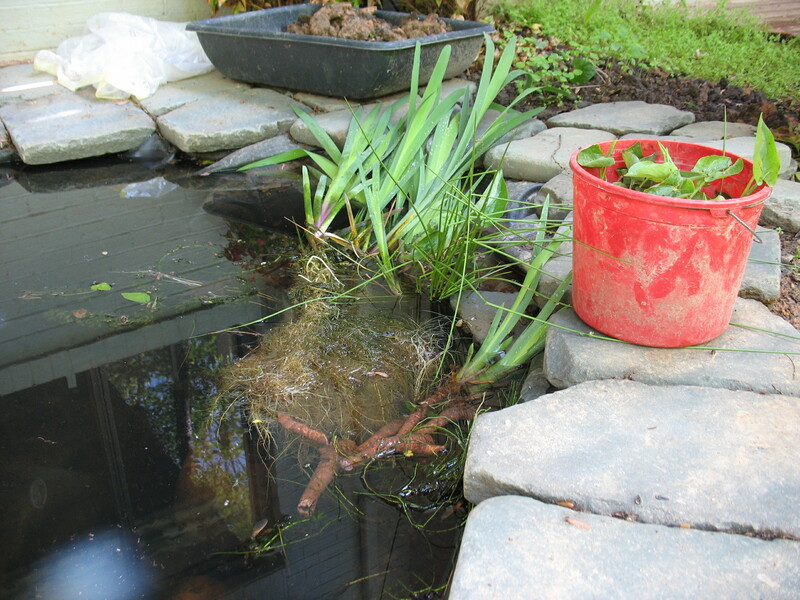 All wildlife in the area of my leaf nest were on high alert yesterday because of the activities at the backyard pond. Ol’ Wally braved the people, who he said were too busy to notice him, and came back with a report. Plants. They’re putting plants in the water. Ol’ Wally went back to watch, so I didn’t have a chance to ask him why. I’ll get a better explanation soon. Hey! 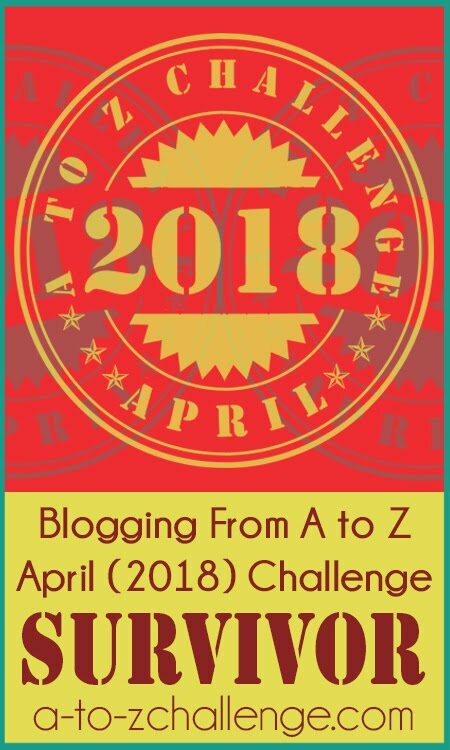 Hickory here on the last Sunday in the Blogging A to Z Challenge. The challenge doesn’t run today, so I’m stepping in with another puzzle photo from our neighborhood for readers to ponder. Let me know what you think it is and I’ll check back later to give the answer. And hey! 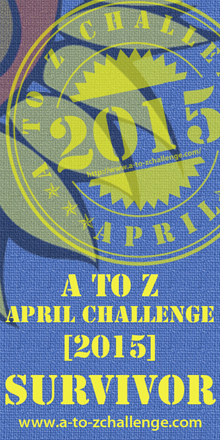 Tomorrow be sure to catch Nutmeg’s last post in the challenge, “Z” !! 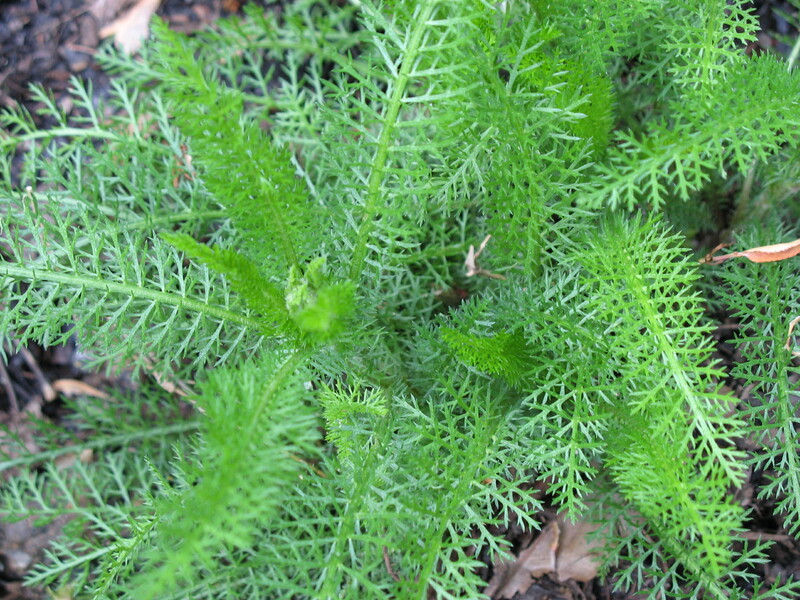 Miz Flora says Yarrow, Achillea millefolium, turns up in lots of gardens, native or otherwise. 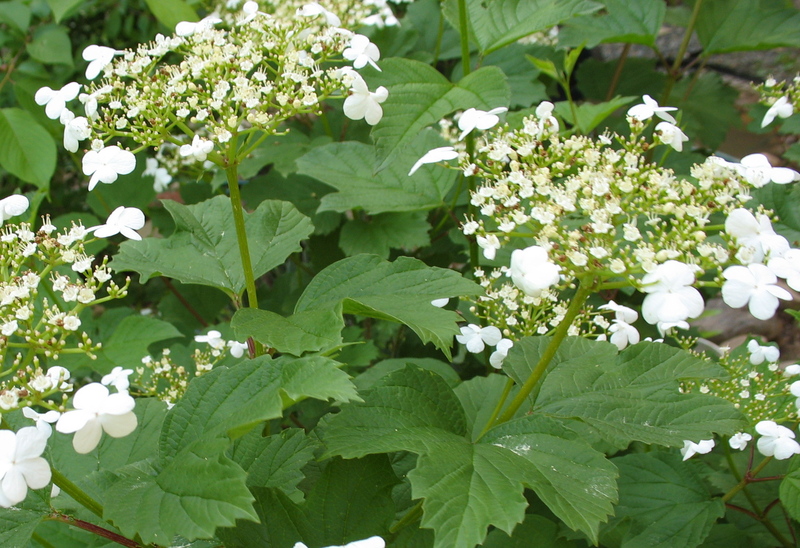 People have used it for centuries for all kinds of herbal and medicinal uses. She doesn’t want to talk about them, because every time she does, she and Ol’ Wally get into a fight about the leaves. “No, they repel bad bugs,” said Miz Flora. I backed away from the argument. 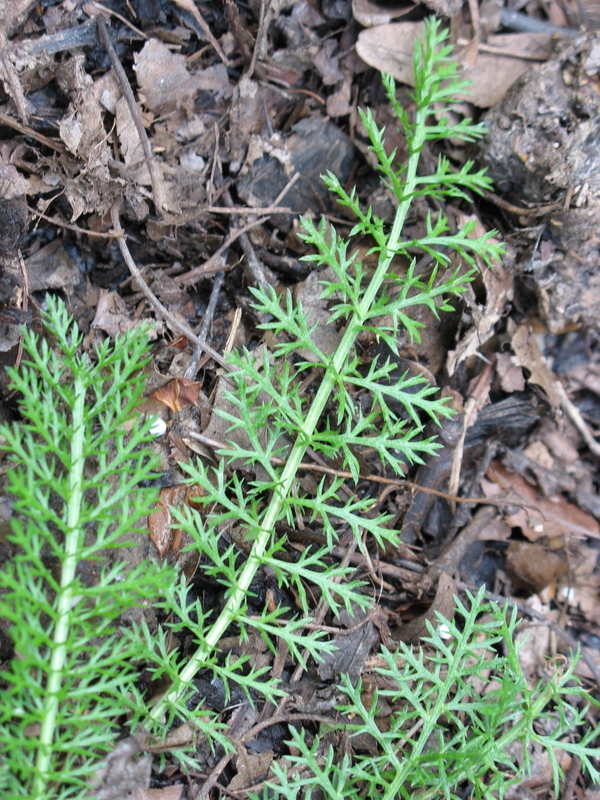 Those little fern-like leaves may be pretty, but that Yarrow plant has some strong folklore attached to it. I’m not looking forward to hearing what the blossoms bring on in another month. Xylem, who’s heard of that? Heh, you get pretty desperate with some of these alphabet letters when you’re sticking to local nature stuff. Xylem is all around you. Well, us squirrels anyway since we live outdoors. We find xylem in young tender stems when we chew on them; it’s just beneath the bark of woody plants, the stems, branches and trunks. See the dark shadow where the bark is splitting from the wood? The xylem was right there. 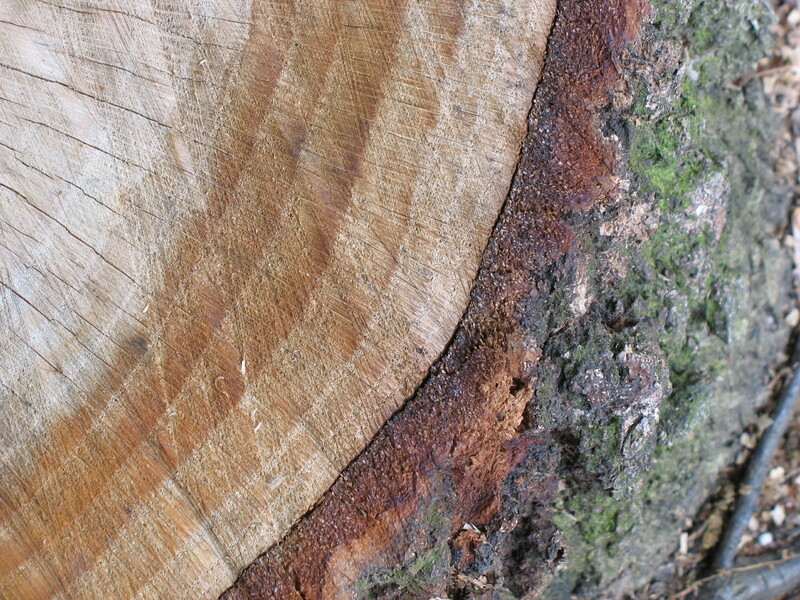 If you peer even closer at the tree rings, you can see the little holes in the wood. Those are the xylem and phloem cells at the end of each years’ growth. 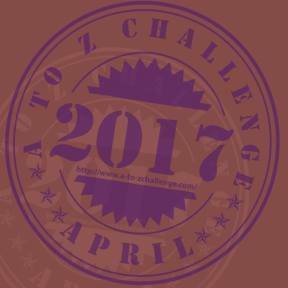 Strange words, I thought, so went online to check them out. 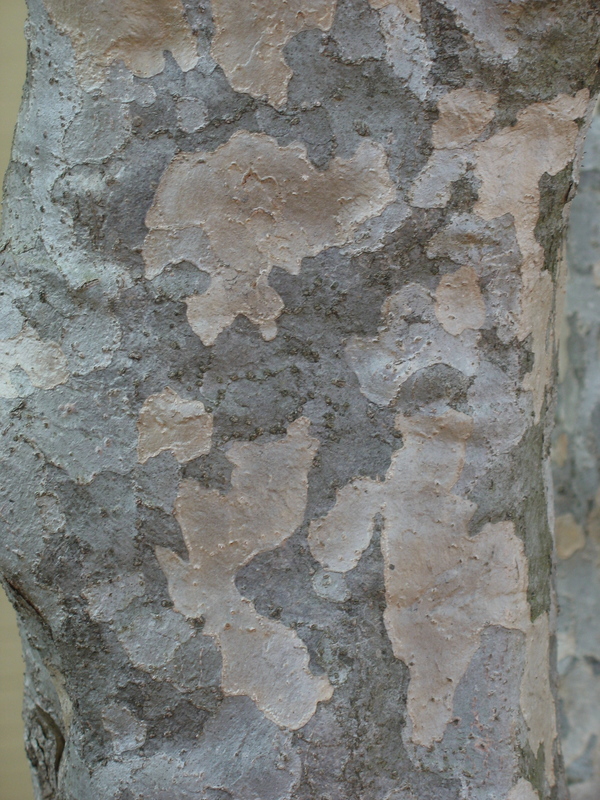 Xylem is from the Greek word xulon, for wood and phloem is from the Greek word phloos for bark. I need it, my squirrel friends need it and you readers need it. Yet, for some animals—and people, we suppose—clean water is difficult to find. 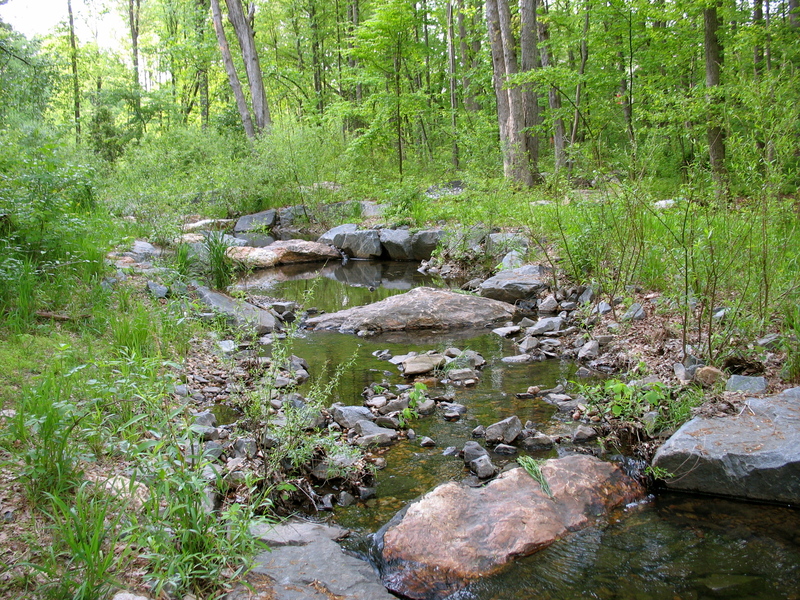 Reston has four lakes and many streams and ponds, but I can’t run across the golf course every time I get thirsty. That’s why I looked for plentiful water in my new home. It’s there in the pond, but also in other catchments the people have set out wildlife that may not want to take a dip. Sometimes water is there, but hard for us to find. 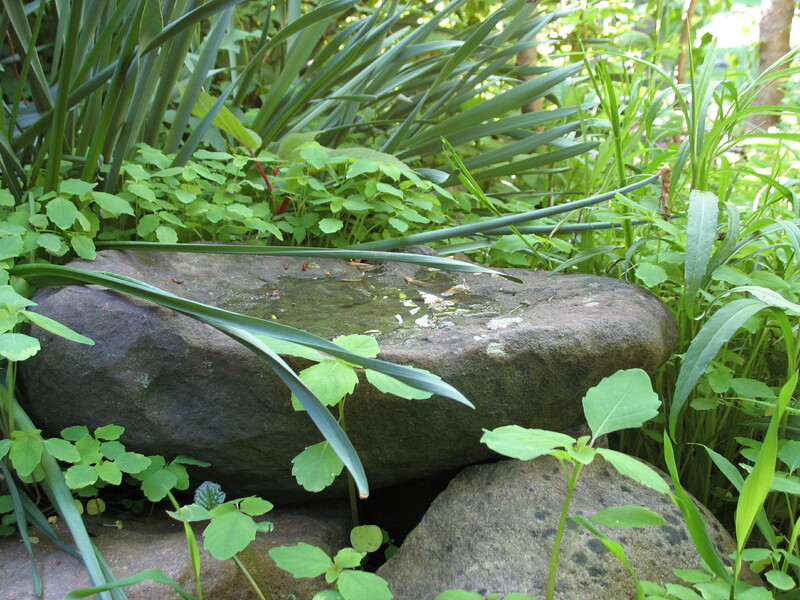 If people put in something that makes a trickle, we hear it and head for the source. I’m not saying you have to go all out, just a little splash will alert wildlife you have thought of them. W is also for Walnut Squirrel, or Ol’ Wally as Hickory introduced him to me. Ol’ Wally is pretty quiet and keeps to himself. He is regularly at the new backyard pond. I talked to him when I was researching the frog eggs (see E day) and learned he is totally into water. 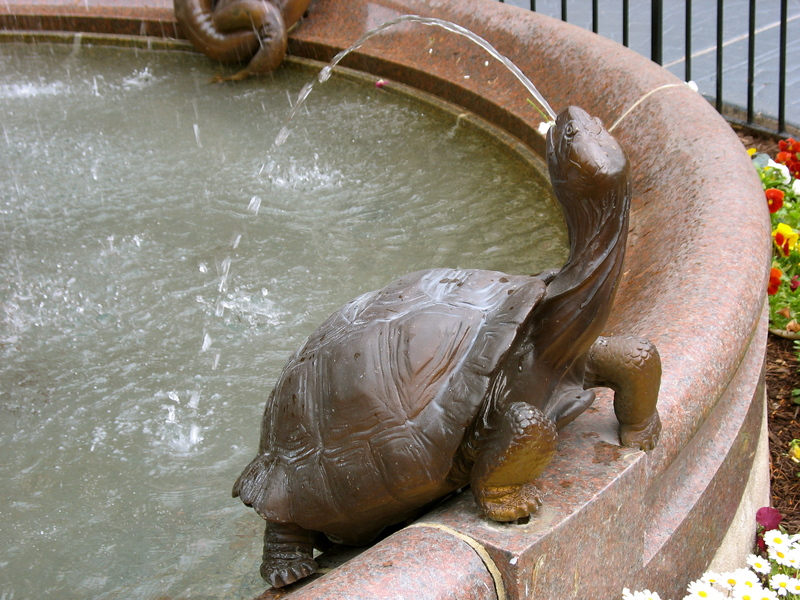 After I sought him out again for S day’s salamander information, he bugged me to feature water. He’s convinced me it’s so important, we may have to make water a regular part of the blog. This is a bushy bush, growing well enough around here you can use it for a hedge. Miz Flora says not all of the Viburnums are exactly native. Lots have been monkeyed with, which I gather is a people thing? But she says they are still great for people helping wildlife because the flowers make fruits that lots of animals and birds eat. Even us, in a pinch. 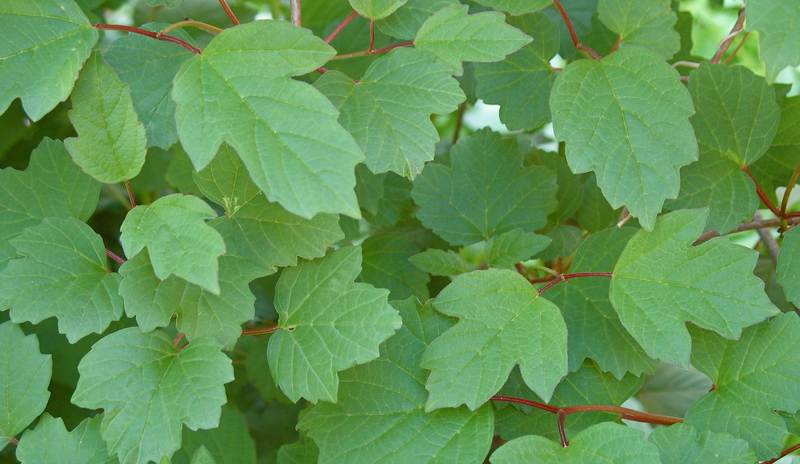 Above is the one most people buy at a garden center, the crossed variety, Doublefile Viburnum, Viburnum plicatum var. tomentosum. 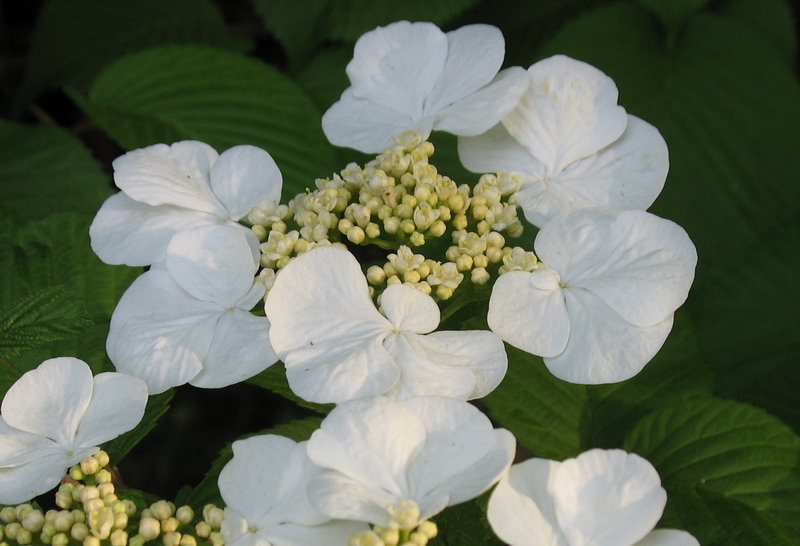 See how the petals are showier around the smaller flowers. Their fruits don’t taste quite as good as the local shrub. 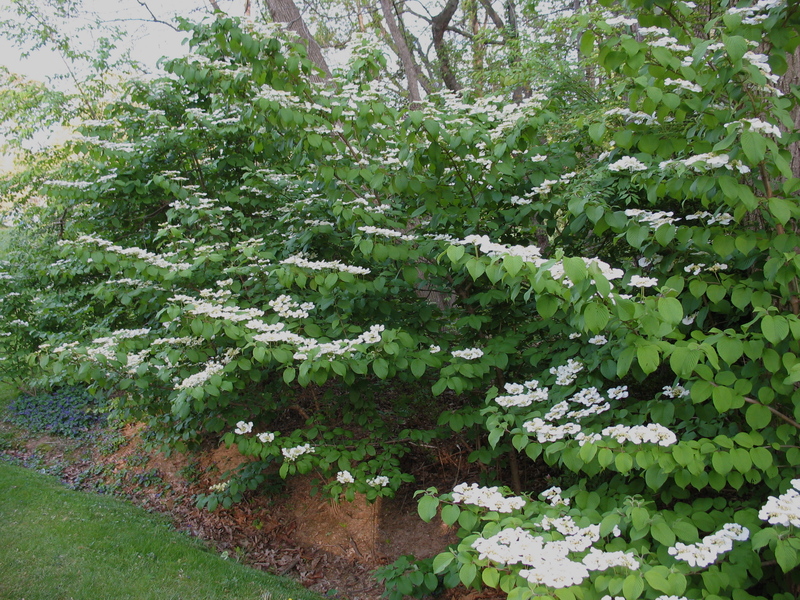 But then American Cranberrybush Viburnum, Viburnum trilobum, doesn’t grow as big or have the showy flower petals either. 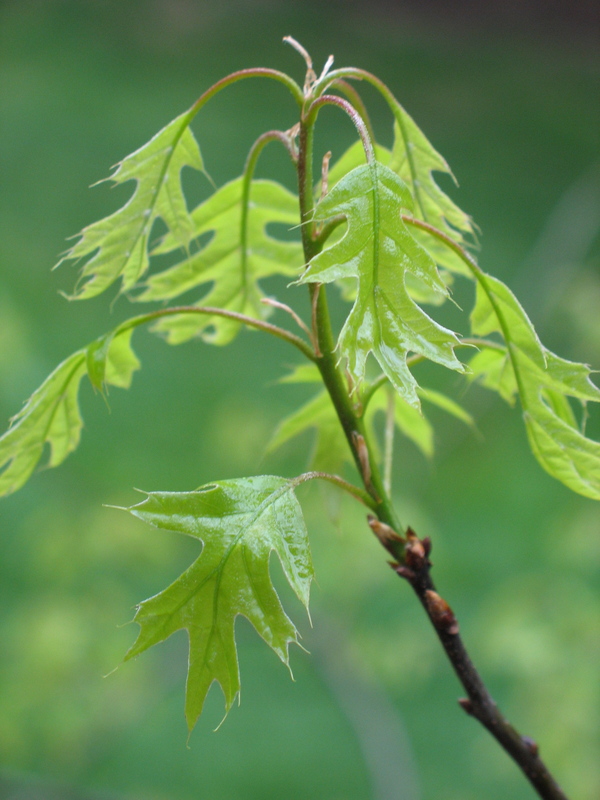 The maple-like leaf is nice and the fruits taste like cranberries and have lots of Vitamin C, even though these aren’t cranberries. 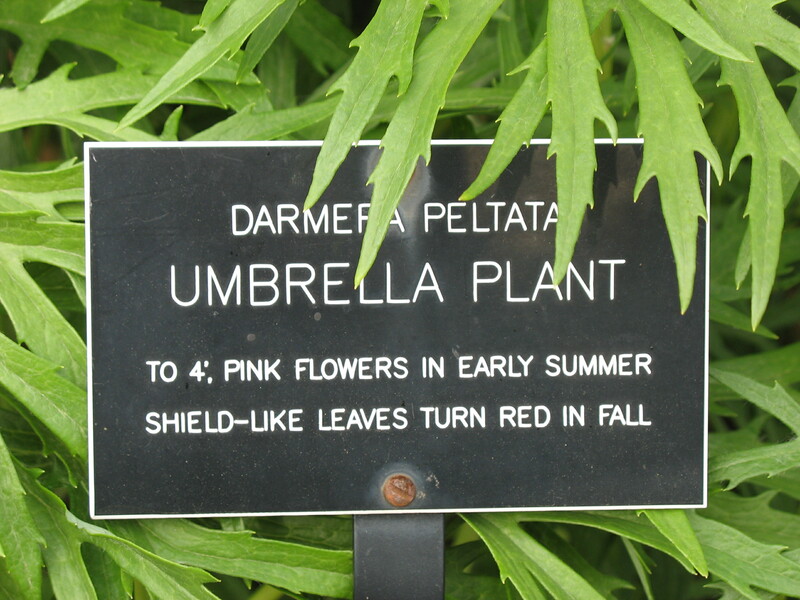 Yes, there really is an Umbrella Plant. One of my correspondents sent this nametag from Meadowlark Botanical Gardens. The plant, however, doesn’t look like it’d be much use as an umbrella. 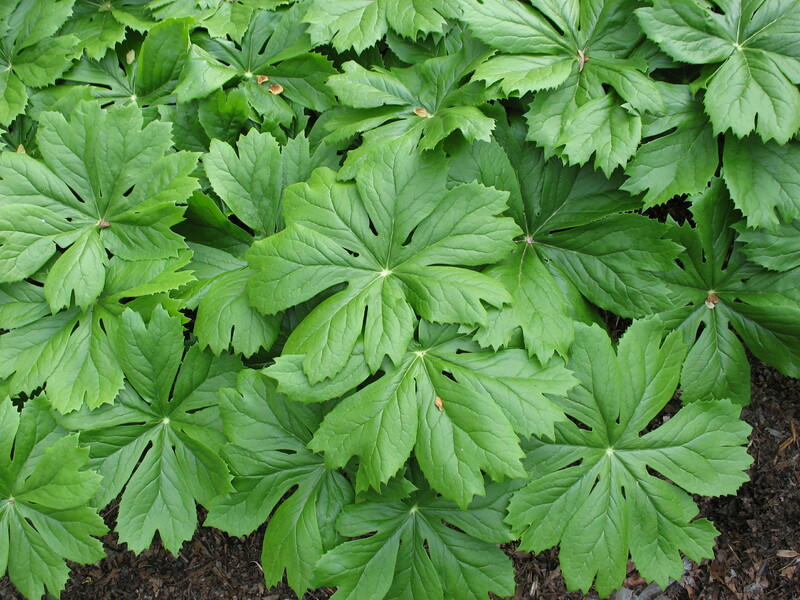 Mayapple, Podophyllum peltatum. Don’t the leaves make a nice umbrella? 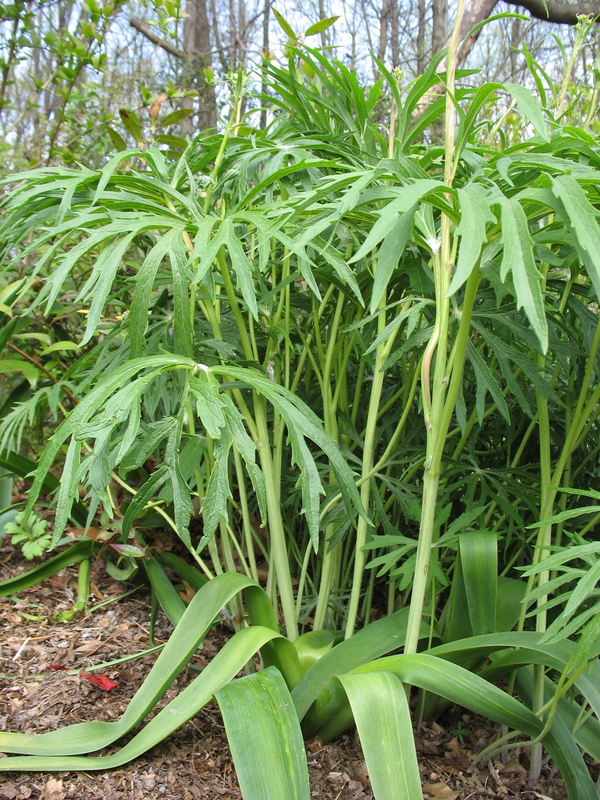 If you creep under them, you can see that the young plants have one leaf, but the older have two. 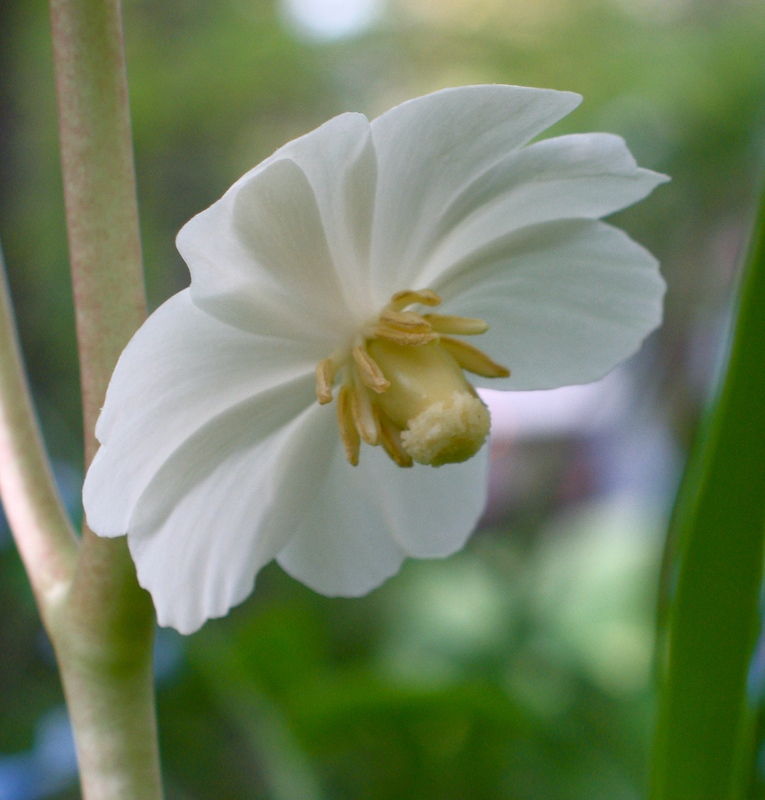 Only those older Mayapples bloom, with the one flower at the point where the stem splits. A single ‘apple’ fruit ripens from the flower in—you guessed it—May! People don’t eat the Mayapples, but many animals do because we can smell when it’s ripe. The unripe fruit will make you sick. 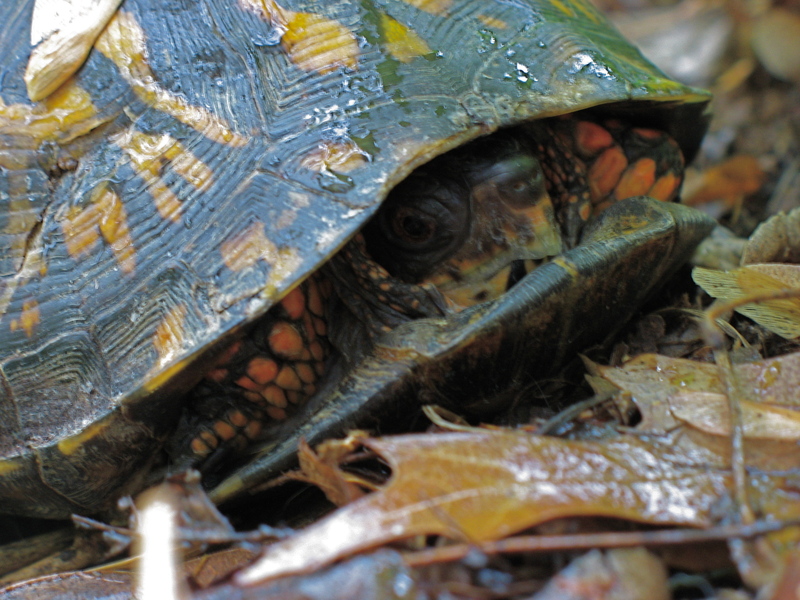 I hear Box Turtles are especially good at smelling out Mayapple fruits. 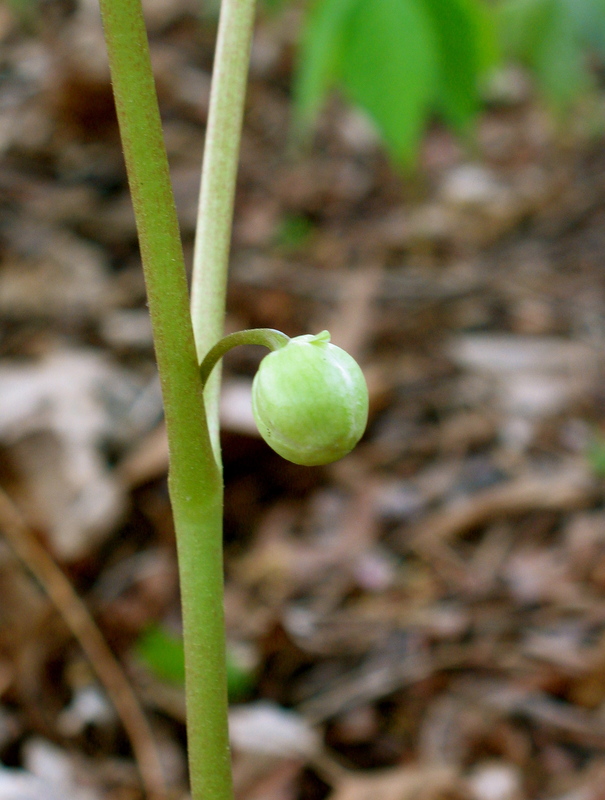 Mayapples grow in the woods around here, but Miz Flora says people can also plant them into their gardens and they grow just fine if given rich soil. When we’re sitting quietly, there is a lot to see below our tree perches. 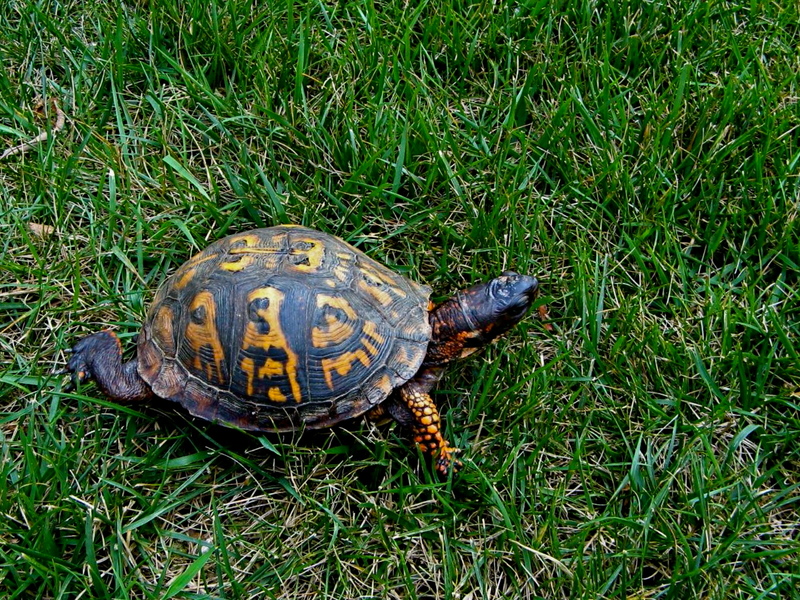 It may surprise you, but many kinds of turtles come trudging across the golf course. 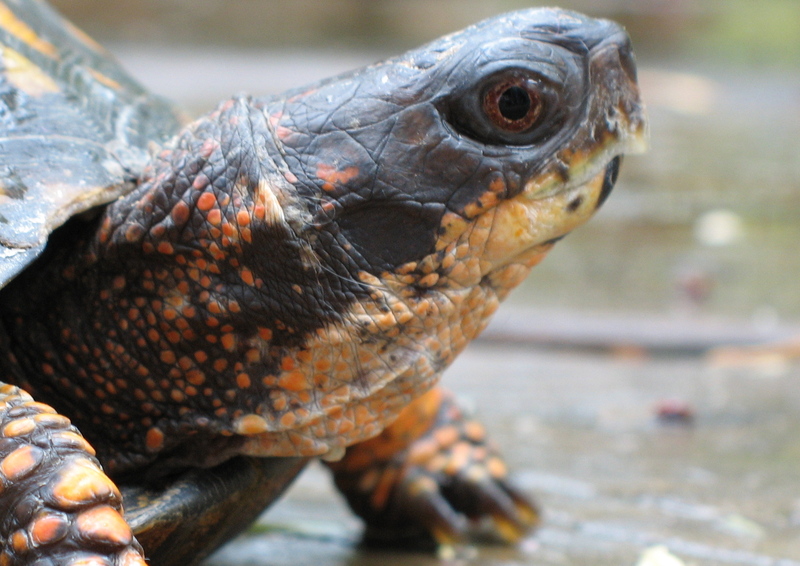 The most common is the Eastern Box Turtle. They walk to the little patches of woods at the edges of neighborhoods, into the backyards and sometimes into the streets. Not a good idea, because they can’t run like we do. And when scared, they play play possum, hiding in their shells, which close like a box. On rainy days like the last few, they really get out. Hickory thinks they like the easy feast of worms coming up from the soil, but I heard from Ol’ Wally they like the wet. He has seen them sitting in puddles and thinks their reptile skin absorbs the moisture. Yuck. A squirrel would never do that. But I have seen some people kits step–and even jump–in puddles. Each to their own, I say. Hey, Hickory here! 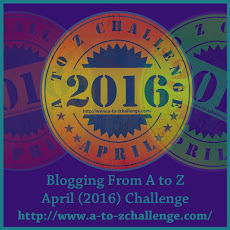 Nutmeg is off from the A to Z blog today, so I’ve stepped in with another rainy day spring plant for you to identify. Will check back later to see if anyone knows this little beauty’s name. Posted in food, What is it? 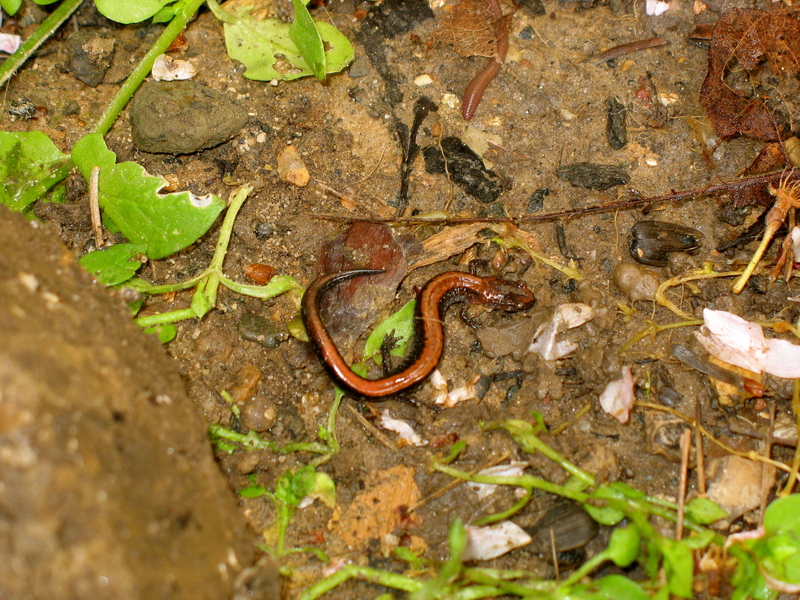 Hickory tells me there have been Red-backed Salamanders in these backyards even before the pond was put in. I asked one of the older squirrels here who regularly checks up on the pond to verify this. “And what do they eat,” I asked suspiciously. A squirrel never wants to run low, and a salamander makes a tasty treat, especially one who might be eating my food. Um, I liked hearing it. Those nasty ticks don’t bother us much, but the whole idea of bloodsuckers gives me the creeps. I’m leaving those salamanders alone.